I am an outdoor queen when it comes to gardening and yard work. Creativity runs deep and I love the challenge of growing plants, flowers, trees and keeping our grounds covered with blooms from Spring through Fall. As a DIY kind of gal, my days are spent in my yard, gardening, cutting grass, and tending to beds. After all, the yard does not keep itself. From cleaning up grass to cutting in fresh edges on my existing beds, there is a lot to do in my outdoor world. What I have found is that a great set of Outdoor Tools coupled with a few other tips and tricks make outdoor work manageable and easier. Lavishly live life out loud and transition my tips for creating fabulous curb appeal to your home. Get ready to clean up, changeup and keep your home looking lovely! Products provided by RYOBI Outdoor Tools opinions and images are my own based on my working experience with the products. It does take a lot of work to keep the beds blooming and weed-free. Sometimes I run into lovely little snakes, frogs, toads, and bugs I would rather now know existed but the benefits of outdoor time run wild. The time I spend making my yard bloom makes me happy and all of our friends love the perennial garden beds I have created so I push on even more. From the front yard to the back domain, cleanup and maintenance must happen. First and foremost get out those rakes, shovels, garden gloves and kneeling pads out and ready. Plan on spending at least half a day outdoors. Ready your water cooler and preplan a meal. Next, head outside and snap a before photo and get ready to transition that yard to an incredible before and after. Trust me gratification is best met with a photo to show you the difference! Also, a photo gives your bragging rights, we all need them! No need to hire a service, nor to clear out large spaces to store outdoor power tools. Rather check out the incredible tools that convert or ‘EXPAND’ into different tools. 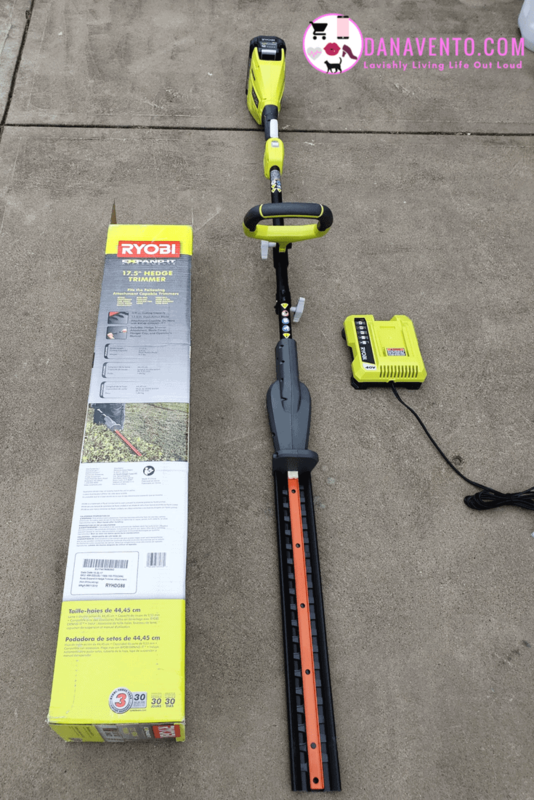 Perhaps my most happy find to date, are outdoor tools by RYOBI™ that do not take too much storage space and easily converge from trimmer to edger and optional other attachments. The outdoor power tools are the Ryobi™ Expand-IT™ Attachments & a string trimmer base (more to come stay tuned). Work at your own pace and feel a sense of accomplishment as you move through tasks in your yard. Finding a tool that is multi-functional with about a 1 minute changeover time (time from unscrewing and changing attachment to attachment) is a big deal. Most of us don’t have a ton of space to spare for storing outdoor tools so a multi-functional base offering different attachments are key! Power up but don’t use gas, use a rechargeable battery! Trust me, we used to be the 2 that used gas power for everything, we have changed and the RYOBI™ outdoor tools are what changed our minds. More specifically the Ryobi™ Expand-IT™ Attachments & a string trimmer base! Brushless 40V String Trimmer (straight shaft). This is the main body of the RYOBI™ EXPAND-IT™ Attachments that you want to get first. From here, you can change this up to fit whatever need you have around your yard. (trimming, edging, cutting, cultivating, etc, all based on your attachment purchases and needs). We added a hedge trimmer attachment (which I will discuss below) and an edger attachment. Each of these has multiple functions and purposes. Literally, it takes seconds to exchange the attachments. You are loosening the bolt and pushing the pin in and pulling it out. Suddenly you have a different tool to work with. 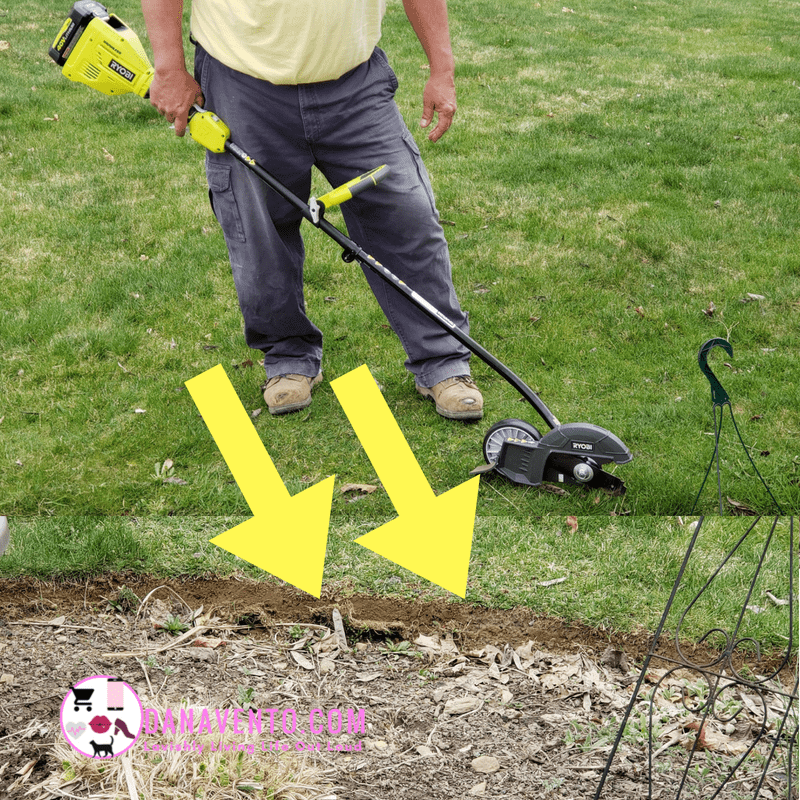 This brushless 40 V String Trimmer trims all the edges and hard to get spots around the house, corners, and equipment. Our first clean up was on the dead tall grass from last season. As the tall grass is strutting its ugly brown, it needs to go fast! So we decided to use the hedge trimmers. Turn on the power pack (this packs a punch) and trim. Look at the tall grass falling, no hand clipping required. BOOM! Instant Bliss. That 40V battery is amazing. It has great power behind it and the hedge trimmer attachment does all the hard work. If only we could find someone to clean it up, lol! Flexibility is key to having tools that work. So why we love this tool is because it not only cleans up tall grass but hedges, and evergreens. It has a long reach so it makes getting those higher branches trimmed more easily. No more hard laboring with hand trimmers to cut this down, just a few sweeps of the 17.5″ Hege Trimmer EXPAND-IT Attachment and it’s done! The battery pack makes it possible to work ‘cordless’ and still be powered up. Why do I mention this? You don’t want to be corded and cutting trees, that just can set you up for an unforeseen accident. RYOBI™ EXPAND-IT™ Attachments work with a 40V Lithium-ion battery (rechargeable) and each piece attaches to the trimmer shaft. Year after year we whittle away at our edges on every bed around the yard. Usually, this leads to massive wheelbarrows of yard debris and so many endless trips to our compost pile. Truth be told it is exhausting. The spade has to dig in, your muscles kill at the end of the day and your foot! Stop the madness, and use your RYOBI™ EXPAND-IT Edger attachment to do the hard work for you. Rather than hauling tons of debris, it will be minimalistic and yet look better than any edging you have done to date. Take a look at how effortless this is for cutting the edge along our beds in the back. No digging in with a spade and killing your foot, just touch the On switch because it is battery operated. Super easy to use. Coming from someone who is used to use a gasoline-driven edger, the battery pack (40V) is as powerful as and easier to use! So glad we made the switch! The battery power is one thing we love but, we also love the fact that the tool is so flexible in use. As mentioned once you purchase the Brushless 40V String Trimmer, which is the body, think of it as the base, then you can ‘EXPAND-IT’™ to a hedge trimmer, edger, blower, pole saw, cultivator, brush cutter, straight shaft trimmer, or curved shaft trimmer when you purchase those attachments. A versatile tool in function as one base has many options. Now, there is no more storing multiple tools, just attachments. The end results of gardening is great. That said, you have muddy hands, tools and everything needs wiped off, blown clean and hosed down to get the great final look. Blowers when maneuvered right eliminate the need for sweeping. I truly heart blowers. I refused to even go in the mudroom after a day out on the property. No way. The mess I have on me is so ridiculous. I start with a good wash off outside, however, this princess has a table and sink. Yes, that’s the one I own and I love it. The outdoor sink table is practical and functional. Did I mention that the outdoor sink table is portable and simply hooks up to a hose? So how do I use this for gardening, outdoor work, and grilling? For gardening, I rinse off the harvest, the herbs, the tomatoes, beans, and of course my hands. In addition, I can cleanse my garden tools and get them shiny and ready for the next day’s tooling. For grilling, this table takes my outdoor cooking to the next level. As it is portable, I set the table up near the grill, and as I use the utensils, I clean them off, rather than dripping across the cement with dripping, tools. The other bonus of this is the bucket. The residual wash is in the bucket and when I am done with the grilling, I simply allow the water to drain across the grilling area and follow it up with some cleaning detergent, making it a practical reuse and putting the dirt back into the ground where it came from! As a DIY gal, I kind of have a passion for getting things done and then cleaning it all on up! I am lavishly living life out loud with the ability to clean up no matter where we are inside or out! *Product only was provided to facilitate review & affiliate links contained within! wow beautiful article, anyone can easily understand this article. thank you, Dana Vento for your excellent article. I read this post. Your post is very helpful and informative. My garden is all time take care my father. You post link must send for read my father because I think this post must help my father work. Thank you for share such a helpful tip. I love lawn and lawn products and you have describe this simply but amazingly. Your article is very helpful for me. I’ve been looking for some lawn products. I like that you talked about how you can get cordless lawn products, which I think would be great. I’m going to have to look for some lawn product options and see what we can find! Hi Dana, so nice to read blogs like this one. I have in my backyard something similar. It is big powerful gardening tool. Thanks for your tips. Keep sharing! So nice to read blogs like this one. I have in my backyard something similar. I just want to look like yours! So, I will start as soon as possible. Mowing the grass can be very hard if you don’t have the right tool. Curb appeal is a really great machine to have. Do you agree? Dan Hatcher recently posted..How To Fog Your Yard For Mosquitoes-Do Mosquito Foggers Work? Nice, seems like not too big yet powerful tool. I always wanted to be a landscaper, one of my dreams – As of now, I cannot have that luxury yet as my husband won’t allow me. But I’ll do the recommendation though. Jocelyn recently posted..15 Easy and Adorable Fish Crafts To Make With Kids + $50 Amazon Gift Card Giveaway! The Hege Trimmer EXPAND-IT attachment really sold me. My husband loves (well at least he doesn’t complain about it) yardwork and these tools we be handy in our own home maintenance upkeep. 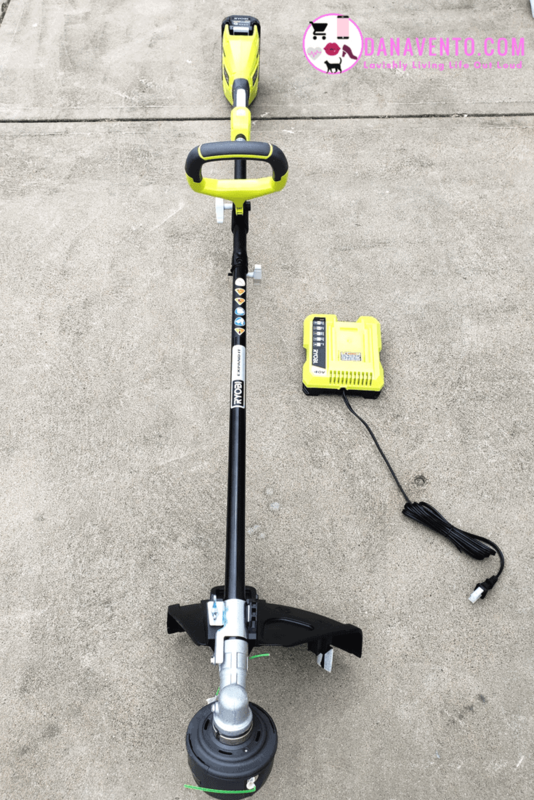 The RYOBI™ EXPAND-IT Edger attachment sounds like it will do a lot of hard work beautifying your yard and be a space-saver too. 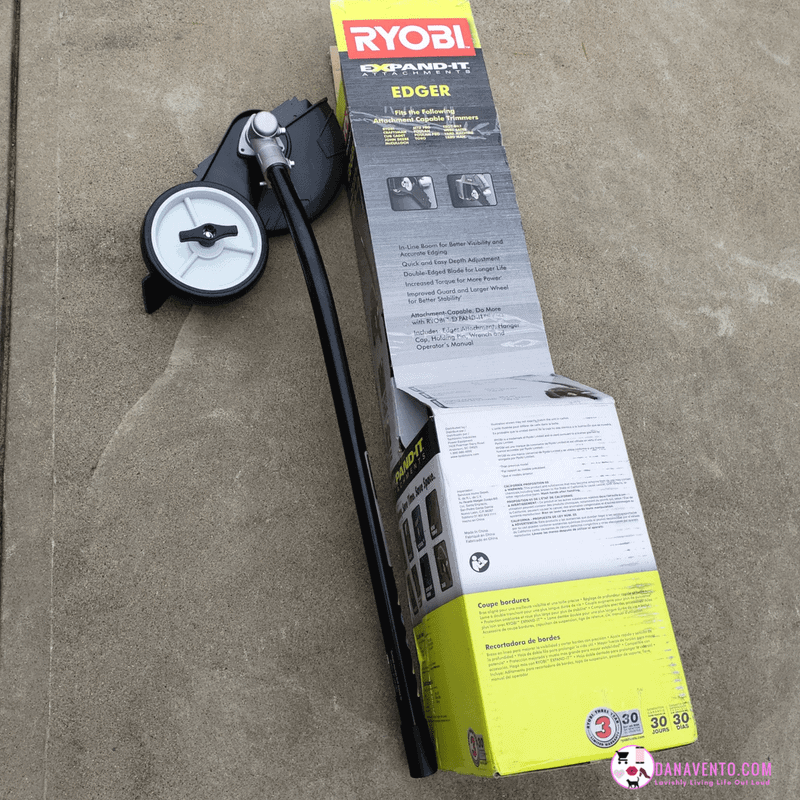 This RYOBI Outdoor Tool is amazing! This looks like a fabulous product for any homeowner to use to make their home look lovely as they can! Looks like a great tool and a relaxing activity by the way! I think I will buy one as soon as I have a lawn! My mother takes care of all that. Will have to pass on the info! Thanks! Thanks for these tips! I struggle when it comes to the yard work! Kristi Ann recently posted..Spring 2018 The JoJo Siwa Box – Inside The Box!! That strimmer looks epic and so handy, I am loving that it is cordless too, that is a godsend for gardening equipment indeed! A really great post here, I got some really great tips. Wow! Those are some impressive yard tools. We have several tall grasses around our patio and I always leave it for the landscapers to trim them. If I had the 17.5″ trimmer, I would definitely try to do it myself. I love DIY projects. Though sadly I’m the time to look at them and think “wow that’s cool and simple” yet never actually try to do it myself. How do you modivate yourself to do DIY projects? SO .. we just break things into small chunks and whack away at the list to be honest. We are both so busy with our full time jobs, our 3 kids and a house, but we want all things put together. Mike and I decide what we have to accomplish and we go at it. He will do the cleanup, I do the planting, someone does the cleanup, its all just a part of being in a house;:) lol It is fun and relieves stress for me, but I am a project kinda gal! Glad you have include all the pictures of the gadget/outdoor tools to use to make this curb appeal. Ryobi expant it look like a cool tool which save money and time. Curb appeal REALLY makes a difference. My husband and I were house hunting for 2-3 years and hot damn curb appeal alone would make meNOT want to see a house!